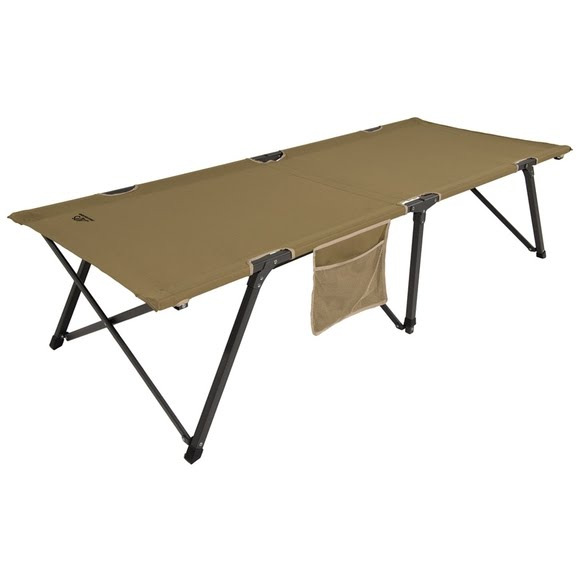 ALPS Mountaineering Escalade Cot is a unique item because it sets up so quickly and easily... and taking it down is just as easy. The fabric and frame are all connected, so there's no assembly required. Basically after you take it out of the included stuff sack, you unfold the cot and it pops open, leaving you ready for a good night's sleep. ALPS Mountaineering Escalade Cot is a unique item because it sets up so quickly and easily... and taking it down is just as easy. The fabric and frame are all connected, so there&apos;s no assembly required. Basically after you take it out of the included stuff sack, you unfold the cot and it pops open, leaving you ready for a good night&apos;s sleep. Not having end bars to attach also ensures that your head won&apos;t ever hit anything besides fabric. When you wake up in the morning, and are ready to pack it up, you simply turn the cot on its side, let it collapse and fold it up. It&apos;s really that easy! The angled legs on the cot prevent it from rocking back and forth and the center support makes the cot rock solid. Measurements 35" x 87" x 20"